Student Success @ DCC | Decide your future. Achieve your dream. Decide your future. Achieve your dream. A job interview is all about getting one foot inside the door. Every applicant knows that giving the hiring manager a positive first impression is crucial. With stiff competition from a dozen or more other applicants, one minor career mistake can undo all your efforts at landing a job. As with many things, however, proper preparation can be very helpful. It’s not enough to walk into an interview and offer a winsome smile. Do your research and prepare for difficult questions. One of these tricky questions has to do with termination. How exactly are you to explain why you were fired or dismissed from your last job? Many applicants do not even consider the question, and therefore end up saying whatever comes to mind when the interviewer broaches the subject. Here are five ways to help you formulate the best answer. Before going to the interview, consider that this is definitely one question that will have to be discussed. Future employers will want to know why you were dismissed, lest the reason be something that affects their own organization later on. Analyze the events leading to your termination as objectively as you can, without shirking responsibility. When you approach the matter in a calm manner, you’ll be able to see where you (and your previous manager) might have gone wrong. Just because you were fired doesn’t mean you have no more chances to get employed by someone else. Hiring managers know that there are a lot of reasons behind terminations, and this doesn’t automatically put you at a disadvantage. This doesn’t mean you have to prepare a memorized answer. Just a general outline of your response to the question should be enough. State the facts as truthfully as you can. When explaining your previous termination, it can be tempting to push all the blame on your former colleagues or boss. Refrain from doing so. It will reflect poorly on you. Stay objective, note where you and your previous manager may have made mistakes, and keep your language professional. A lot of people have been fired in the past; what is important is to show the hiring manager that you’ve learned from your mistakes. Indicate that you’re ready to use your previous experiences to do a much better job with your future one. Wisdom Wednesday: Landing and Internship, Its This Easy! If you’ve just graduated from university or college, there’s a good chance that you’ll have difficulty finding a full-time, paid job in your chosen career path. Part of the problem is that employers want candidates to have proven that they have the necessary skills, and a lot of grads just don’t have enough relevant experience to satisfy such requirements. This is why an increasing number of young professionals are turning to internships—they get valuable experience that will help build their resume, establish a network, and possibly result in a job offer. But the key is to gain the right kind of skills and experience—that’s why it’s important to find the right internship, not just any internship. Your main purpose in taking an internship should be to advance your career. So before you even start looking for internships, you should have at least a tentative career plan in mind. In fact, you should start laying plans before you graduate. First, consider what your ultimate goal is for your career—do you want to become an executive, a consultant, be self-employed, or start your own business? All those options will involve different paths to take through your career, with different types of jobs and promotions along the way. Second, think on what industry you’d prefer to work in—if you want to be an account, for example, you could work at a bank and handle individual people’s finances, or you could work for a big business of various industries to run their corporate accounts, or you could work for a non-profit organization. Marketers, human resources, and programmers are other professions that are useful to many different businesses and industries. Finally, find out what type of entry-level jobs will serve as the best springboard for your career plan. Do some research and find out what types of skills and experiences will give you the best chance at getting those jobs, and pick an internship that best helps you get them. Search on major job boards like Indeed or Monster. Use job boards specializing in internships, like YouTern, TalentEgg, or College Recruiter. Search on niche job boards focusing on specific industries, like Culintro or IT Job Pro. Check your university or college’s career center for listings. Ask friends, family, professors, and classmates if they can recommend good internships. The advantage of internship or niche boards is that they’re also sources of quality information to help you get your career started. Don’t be afraid to reach out to anyone and everyone you come across for advice. Remember your career plan and narrow your options to those that will help fulfil it. Check the company’s reputation with interns and make sure you won’t just be getting coffee for everyone. You have rights as an intern and the company should not take advantage of you because you’re “free labor”. You should constantly be reassessing the quality of an internship opportunity throughout the process. Research the internship on job boards and company websites and ask questions about your role and tasks in the interview to make sure it’s a good fit for you. Be prepared to walk away, even during the internship itself, if you think you’re not being given a fair chance or the training and skills you need. When you get an internship that suits your needs, do not be afraid to ask for advice and training from your supervisor and co-workers. Your internship should be a learning experience in everything you do there—you can learn how to interact with your co-workers and bosses, and the more subtle inner workings of the industry and the jobs within it. Most importantly of all, you should learn how to network during your internship, so you’ll have lasting relationships that can serve as sources of advice, references, and referrals throughout your career. Wisdom Wednesday: Banking Terminology Made Easy! The paperwork that comes with opening a new savings account can be potentially overwhelming and intimidating. But it doesn’t have to be! Greg Spadea, Director of Retail Deposits at Sallie Mae, and Martha Holler, Sr. Vice President of Communications helped review a few of the terms you need to understand. This is the number one thing you’ll see with saving accounts and may also be stated with checking accounts that earn interest. This number tells you the actual amount you may earn on the account by calculating the interest rate across a year’s time. This is important because interest rates can change daily. The difference between APY and the average percentage rate (APR) is that yield takes into account compounding interest. Compounding interest is one of the most exciting parts of interest rates. It means interest earned on interest. Adding this amount to your earnings can increase your earnings quite a bit over time. Be sure to look at the frequency. Compounding interest may be done at certain intervals. For instance, interest could be calculated monthly, quarterly or annually. Use online calculators to figure out how this will effect you based on the amount you’re saving. This is the difference between a bank and non-bank products. Also, having your money insured by the Federal Deposit Insurance Corporation (FDIC) means that if the bank becomes insolvent or no longer a viable entity, your money will safely be returned to you. If FDIC does not appear, you should approach with caution. If a bank becomes the insolvent, up to $250,000 per institution of your money is protected. *Insolvent means that the banking institution is no longer financially viable or able to give back the money they are holding. If you are going with a credit union for your savings account, look for the NCUA symbol. NCUA is the National Credit Union Administration. If you do not see it listed, you may be looking at product and not a checking or savings account. Many financial institutions look like banks, but do not have insurance to protect your money. Sometimes banks may require you to maintain a minimum balance to avoid fees. On a checking account, this fee can sometimes be thwarted by utilizing direct deposit services. Savings accounts are a bit different. If the fee exists, you may be able to avoid it with automatic deposits of a certain amount. Excessive withdrawals fees might exists for a savings account if you withdraw money more than 6 times in a month. This could cost you an average of $15 per excessive transaction. Note: While the terms are generally standard, the amount of associated fees may not be. Always read terms and conditions for the bank accounts you have and the ones you’re considering opening. You can have terms printed at brick at mortar banks (ones with physical locations). Online banks can email this document to you. You may also be able to call the bank’s customer service center to get questions answered or direct you to where to find the answer on the bank’s website. Studying with a group is a well-known concept. When it comes down to the last few weeks before the test, contact a couple of the other students in your course and create a day to do a group study. Try to keep the group generally small, no more than 8 people, or you will be fighting to stay on topic the whole night. Plan to meet up at a location on campus like the library and cram together! Have someone quiz you: One of my favorite ways to study, especially when I’m cramming last minute, is to have a person who is not in my class and does not know the material quiz me. I give the other person my notes, note cards, textbook, or study guide and have them ask me questions from those materials in a random order. If they do not understand the material then I have them ask me more questions regarding it, which helps me learn the material better by teaching them! For my history midterm I had to write an essay at home, memorize it, and then re-write it during class on the test. To study for this I highlighted the important points that I needed to cover, gave my friend the essay, and recited it over and over again to them. They were incredibly patient and helpful leading me through this. Reciting the essay back and forth with them definitely helped it stick in my memory and I got a 100% on that test because of it! I know, it may seem like a God-send at first, but it could be killing your grade. While there is no harm in having a little coffee to perk you up in the afternoon to study, drinking a lot of caffeine anytime in the evening could be harming you. According to the National Sleep Foundation it takes about 6 hours for one half of the caffeine effects to be eliminated. This falls under the category of “get sleep” when you’re studying for finals or doing school work. Sleep is mandatory for your brain to function well and, despite some preconceptions, pulling all nighters for studying is a bad thing that will more than likely make it more difficult to retain the information you studied. This may just be me, but I don’t learn well while I’m sitting still. While I was reciting my essay back and forth with my friend, as I mentioned in the first tip, I was pacing around, jumping up and down, gesturing with my hands, and changing the volume of my voice constantly. For me, test taking environments are hectic. Even in complete silence, where everyone is sitting down, in my head we are all jumping and screaming and pacing. So studying in this environment helps it to stick with me when I’m in that environment taking the test. Moving around also helps my mind remember what I’m learning as it causes me to focus on multiple things at once. As I mentioned in the first tip, I highlighted the important points in my essay that I needed to memorize. I am very much a visual learner. Colors help our brain and eyes pull out information to store. When I was studying that essay I would highlight the main points that I needed to memorize word for word in pink, the smaller points I needed to touch on in any words in orange, and other points that I would get extra credit to mention in yellow. When I was writing the essay in class my brain would instantly hop from color to color to remember the words I highlighted. Even when I take notes in class I use different colored highlighters or pens to make things stand out: categories, key words, vocabulary, important pieces of information. When it comes to studying I will do anything to procrastinate, even if it means doing my other school work. We all think ‘it’s not procrastinating if it’s productive! I’m still getting work done’ but you’re avoiding something else that you need to get done, that is procrastinating. When it’s time to buckle down and focus on studying for a test, make sure that your other assignments (projects, power points, papers, etc.) are complete before you start. This will eliminate some of the most distracting factors, even those that are still productive to procrastinate with! I also tend to make sure that my workspace is clean, my laundry is done, my bed is made, and the trash is taken out, all before I start. Or, knowing myself, I will do all of that instead of studying. I know this seems drastic. Logging out? Can’t I just close the browser? It’s too easy to think ‘oh I have to look this up..’ and opening your browser to go Google a piece of information for your project, only to find Facebook as your homepage, or to find yourself tapping the Tumblr bookmark button out of habit, and then finding yourself getting distracted by something on the first page. Next thing you know, it’s 3 hours later and you’ve done exactly nothing. Log out. That way when you click that bookmark button or somehow unconsciously end up on Pinterest, you won’t see any status updates or pictures of kitties or cute marshmallow snowman recipes to distract you. Or have your roommate do it! Drastic times call for drastic measures. Phones are another distraction! There is a time for work, and there is a time to relax. Every once in a while during a particularly stressful or frustrating time I take my roommates out to do something fun. Midnight In-N-Out runs are one of our favorites! Or if I know there’s a particularly stressful week coming up (such as finals or tech week) I’ll go to the store and stock up on a ton of my favorite candies. Another thing that I do is I treat myself with one small candy for every page of work I finish. I started this technique back in middle school when I was struggling with finding motivation to do my math homework. I would set out a handful of chocolate chips or Cheez-It’s and eat one for each math problem I finished. GMOBSERITC. To you, that’s gibberish. To me, that’s the ten steps of the Stanislavsky system that I had to study for my Acting class midterm. Studying straight facts is the most difficult thing for me. Memorizing, memorizing, memorizing. Making acronyms tends to help me (and my roommate who helped me study that) cram for important facts, even if the acronyms don’t make real words they still aid in getting all that information crammed in one space. Ok, so this is one of the ‘normal‘ tips that I mentioned that everyone says. But it really does work! I use this as a form of quizzing myself on the material by writing it over and over again. There’s something about how writing things by hand helps you remember it. I’m not just talking about writing notes by hand in class but also writing by hand again and again to help improve your memory of the material. Before you know it will reach 3am the morning before the test, and you’ll be asleep on your textbook. Know your limits. Don’t let that happen. While sleep is important, rest away from work is also important. I had a rule during high school: If it’s not done by 9:30 it’s not worth it. I stuck with that (sometimes extending it an hour if it was an important assignment or if I had been procrastinating a ton) and I still managed to get through high school with great grades. Now, in college, I have bumped that rule up a little bit. Considering that I don’t normally go to bed until around midnight or later now, the 9:30pm rule would not be realistic. I’ve made a mental rule that when I feel exhausted or done: to stop. That’s it. Most importantly, my mental health and physical health matter more than my grades. I will try my best, but I won’t beat myself up over it. That’s my motto. Originally posted on Dani Dearest. Wisdom Wednesday: Top 5 Things To Know About Money Before You Graduate! Congratulations! You’re graduating from college and you’re on the cusp of making real money. It’s exciting. But it can also be frightening. If you’re like most people, you’ve focused most of your energy on grades. You haven’t had a lot of time to pay attention to your finances. No worries though. This article is about to tell you the top five things to know as soon as you walk across the stage. Now is the time to become familiar with any student loan debt. While many loans have a grace period, it’s still important to face your loans right now. And in case you’re wondering, a grace period is a period of time between graduation and when you must start making payments. Grace periods are usually six or nine months. Contact the National Student Loan Data System if you’re shaky about the terms of your loans. Figure out how much you can afford to pay back each month. Create an action plan. Student debt is not easy to discharge – even in bankruptcy . Therefore, paying your student loans should be a priority. Your credit score is important for many reasons: employment, buying a house – even just getting a rental agreement on an apartment. The higher your score, the better. It’s okay if you don’t know your score right now. To get started, you can go to annualcreditreport.com . It’s a government website that lets you see your credit reports. Make sure all information is accurate. Although this won’t give you a credit score, it’s good to make sure there are no errors. Then you can know your score is accurate when you do discover your score. There are many ways to get a credit score for free. For instance, many major credit cards come with free credit score monitoring. Here are several other ways to keep an eye on your score. You can fairly easily become a millionaire if you begin contributing to your retirement plan early enough. Plus, if you start contributing to your 401(k) on day one, you won’t miss spending the money. Ask anyone who’s age 50 or older; this is a great idea. You can also contribute up to $5,500 per year to individual retirement accounts. As a fun illustration, let’s assume you graduate at 22. You have $0 saved for retirement. But this same year, you begin contributing $5,500 annually. You invest the money in a simple mutual fund. Let’s assume you earn 7% annually – a very realistic number. Let’s say you retire at age 65. By this time, your account will look pretty healthy. At just $5,500 per year invested, your account will have grown to $1,458,154.01. At $5,500 per year, you’re virtually guaranteed to become a millionaire. In the United States, you’re allowed to be on the health insurance plan of your parents until age 26. So you may have a few years. But it’s best to know what’s on the horizon. If you’re curious how much your own health insurance will cost, check out healthcare.gov and run an illustration. Or ask your employer to see how much the plan would cost. I think the biggest takeaway of this exercise is to calm your fears. I know health insurance is a hot topic in the media but it’ll likely be cheaper than you think. Being an adult doesn’t mean being broke! While some people do like budgeting every dollar, it’s not necessary. Budgeting can just be a catch-all word for watching how you spend your money. What is it you value? In what ways do you want to spend your money? Cars? Travel? A large home? Charity? A little of each? Budgets can help you meet your goals – even if they are more of an outline than a line in the sand. If you’re responsible enough to have read this article, you’ll probably do just fine with your money. Just remember to earn, save and invest consistently. Enjoy your first ‘real’ paycheck! Wisdom Wednesday: 20 Helpful Websites for Students! Stack Exchange – a collection of question-and-answer communities. If you’ve got questions about chemistry, math, programming, or pretty much anything else, you’ll probably find an answer here. Wolfram Alpha – a “computational knowledge engine”, this site can calculate basically any math problem and come up with data on all kinds of things! Step-by-step solutions to math problems used to be free, but they cost money now. For a free (but less easy-to-use) solution, try SymPy Gamma. StudentRate – a site that aggregates student deals and discounts on clothes, travel, textbooks, electronics, and lots of other things. Sleepyti.me – uses the sciences of REM cycles to calculate the optimal time you should go to bed in order to feel well-rested, based on when you plan to wake up. Habitica – formerly HabitRPG, this website is a great tool for helping you develop better habits, and breaking bad ones! Todoist – task manager of choice. This website has a clean design, great organizational features, and your tasks sync across multiple platforms. Google Calendar – old and trusty. Google Calendar hasn’t changed a whole lot in the last few years, but it really doesn’t need to. It is accessible in any browser, has great smartphone apps, and just works. Dropbox – Dropbox keeps all your files synced, updated, and backed up across all your computers. Recently, their browser interface has gotten much better – you can now preview most file types right in the browser without having to download them. Lynda – a huge library of video courses that can help you learn tons of skills, mainly centered around computing and media production. Lynda is particularly good for learning the ins and outs of computer software. Mint – a tool that lets you view all your financial account in one place, track your spending, and set up budgets. Rate My Professors – a site that allows students to write reviews of professors. Don’t take this sites ratings as the golden standard, but it can be incredibly helpful within reason. Coggle – a cool little mind mapping tool that lives in your browser. Your college website! – If you’re not familiar with it, get on it. Most college websites have course catalogues, schedule planners, financial aid information, scholarship listings, academic calendars, student job boards, and other useful things. Written Kitten – potentially the greatest writing aid ever invented. Set a target word count, and whenever you hit it, you’ll get a new picture of a cat. What could be better? Cheatography – a really cool site that collects cheat sheets that condense information on all kinds of topics. This could be helpful for building study guides. Bibme – a tool that can help you automatically generate bibliographies and source citations. This website lets you search for books and other sources; if it recognizes what you searched for, it can often auto-fill all the citation fields. (Not all citation generators do this)! Ankiweb – This site is legit because it’ll let you create and study your flashcards in the browser. However, you do need to have Anki downloaded first. Instructables – a site where people can post DIY project tutorials. You never know what you might find! One of the most difficult skills to master in college or at the beginning of your career is time management. You can waste a tremendous amount of time by trying to multitask or focusing too much on unimportant details. Montreal-based designer and author Étienne Garbugli has struggled with all of that. As he’s gotten older, he’s learned how to manage his time and workload more effectively and has analyzed what’s worked for him and others. We’ve collected the best insights from both presentations with additional context. You’d be wise to establish these habits when you’re young, because they’re as relevant to a 22-year-old intern as they are to a 50-year-old executive. 1. There is always time. You never “run out of time.” If you didn’t finish something by the time it was due, it’s because you didn’t consider it urgent or enjoyable enough to prioritize ahead of whatever else you were doing. Sorry, your teachers are right! 2. Days always fill up faster than you’d expect. Build in some buffer time. Avoid over-scheduling by refraining from getting too precise with plans. “The more precise a task or objective is, the easier it is to miss,” Garbugli writes. 3. You get more done when you’re in the zone. Some days you’ll be off your game, and other times you’ll be able to maintain your focus for 12 hours straight. Take advantage of those days. 4. You should pursue activities that benefit both your professional and personal lives. “Align your professional and personal goals for maximum efficiency,” author Chris Guillebeau says. For example, if you have no intention of moving to France or doing business there, you’d be better off spending a few months taking a course that aligns with your career interests rather than taking a French language classes. 5. There’s a difference between pushing yourself and burning out. Hard work in college sometimes entails stretches of little sleep and relentless productivity. But even if you’re incredibly driven, you need to make time for relaxation or else your exhaustion will catch up to you and make you less productive than you otherwise would be. 6. Multitasking kills your focus. Studies have found the brain expends energy as it readjusts its focus from one item to the next. If you’re spending your day multitasking, you’re exhausting your brain. The Pomodoro Technique gets its name from the Italian word for “tomato.” Its inventor originally used a tomato-shaped kitchen timer to come up with the idea. 7. Distractions can be controlled. Consider trying the Pomodoro Technique of splitting up work into uninterrupted periods of 25 minutes with three- to five-minute breaks in between, or use software like SelfControl that prevents you from using sites like Facebook or Twitter for stretches of time. 8. Accomplishing something small is the best way to get working. A presentation you need to finish may be intimidating at 8 in the morning. Get your mind on the right path with an easy and quick task, like answering emails. 9. Being a perfectionist can be a major crutch for day-to-day activities. 10. More work hours don’t always result in more productivity. Don’t kid yourself into thinking that sitting at your desk will somehow extract work from you. Do whatever you can to finish your current task by the end of a set period of time instead of working into the night. 11. Work that requires focused thinking and work that doesn’t should be separated. If you’re constantly stopping your flow of work to rethink something, you’re slowing yourself down. 12. Menial tasks should be blocked off. You’ll disrupt your flow if you’re sending emails or updating your planner all day. Set aside a block of time for these tasks. 13. It’s best to reply to someone as soon as you read their correspondence if it will take you a couple minutes or less. Apply “Getting Things Done” author David Allen’s “Two-Minute Rule” to your written correspondence: If an email can be answered in that time, then respond immediately rather than setting it aside. Nick Saban became one of the most successful college football coaches in history due to his intense focus and ability to motivate. 14. Massive tasks are easier to manage when seen as increments. 15. If it takes more than 20 minutes to get started, you should change tasks. If you’re not making progress for whatever reason, move onto something else to get back into a productive groove. 16. No two tasks ever hold the same importance. Daily to-do lists are effective ways of scheduling your day, but it’s important to prioritize them. Start your day with the top-priority tasks, and leave the less important tasks for when you’re mentally drained. 17. Always know the one thing you really need to get done during the day. 18. It’s necessary to delegate some work to other people. 19. Focusing on the past will hinder progress. Don’t distract yourself with either the successes or failures of the past. Focus instead on what’s in front of you. Don’t assume you’ll remember every good idea that comes into your head during the day. It doesn’t matter if it’s a notebook, whiteboard, or an app like Evernote — write stuff down. 21. Keeping larger objectives in mind will help get you through your days. Wisdom Wednesday: Saving on Textbooks! Whether your majoring in Business, English, or Zoology, your textbooks are pretty much guaranteed to be expensive. Sometimes costing hundreds of dollars per semester! Watch this video to learn about how to save money on textbooks! Wisdom Wednesday: Volunteering…What’s in it for me? We often talk about volunteering in terms of the positive impact we can make on our communities, but another approach in thinking about whether or not to get involved is: “What’s in it for me?” While it may seem like a self-centered question in a field that revolves around giving back to others, it’s a logical question. Fortunately, we have good news: volunteering has many benefits! Succeed in School– Service-learning holds the potential to increase the attendance and engagement of students in classrooms and schools. It also engages students in classroom learning in ways that foster academic achievement and increase motivation to learn. Service-learning can also help to address underlying causes of low graduation rates, while incorporating the strategies most recommended for preventing students from dropping out. Land Your Dream Job– A report by The Corporation for National and Community Service reveals that those that volunteer have a 27 percent better chance of finding a job than those who don’t. An additional study from the Center for Economic and Policy Research supports this claim, noting that unemployed people who volunteer between 20 and 99 hours during the year are roughly 7 percent more likely to have found employment one year later compared to those who don’t volunteer. 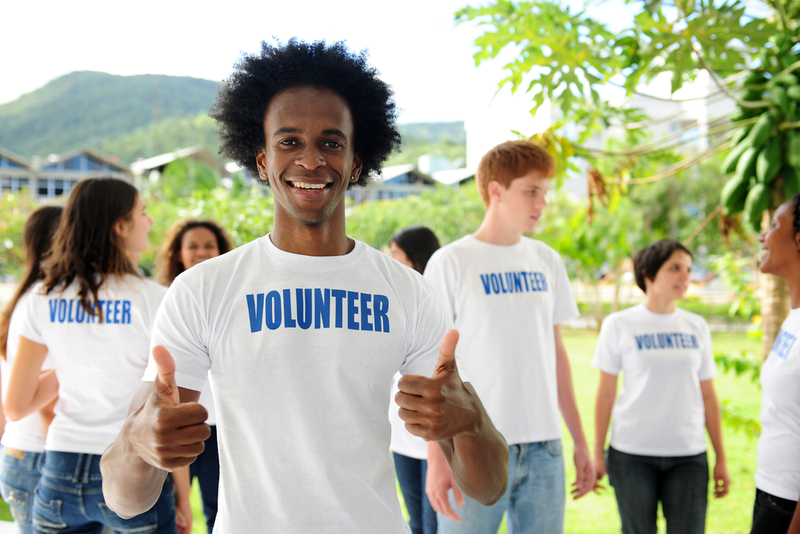 Volunteering helps you build your experience, expand your network, and gain knowledge needed to switch fields. Excel in the Workplace – Volunteerism allows individuals to develop key skills that are essential to success in the workforce. These skills include: leadership, communications, fundraising/business development, patience, problem solving, public speaking, and coaching/mentoring, among others. Stay Happy and Healthy– Research conducted by UnitedHealth Group reveals that volunteers are more likely than non-volunteers to consider themselves in excellent or very good health, and they are more likely to say that their health has improved over the past 12 months. There is also a strong connection between volunteering and mental/emotional health: doing good helps us to stress less, and less stress is an important component to staying healthy. Ready to improve your life? The GOAL Center will now be hosting monthly volunteer opportunities aimed at helping you engage with the community, increase your employability, and enhance your resume! Contact us for more information. Happy volunteering! Wisdom Wednesday: What is a “Good” Credit Score? Learn about who keeps track of your credit score, and some rules of the road when it comes to determining “good” credit. Your credit score is one of the most important components of your overall finances. Whether you want to establish yours, improve it or just keep it healthy, keep these things in mind. Check your credit report for free every year with Equifax, Experian, or TransUnion.